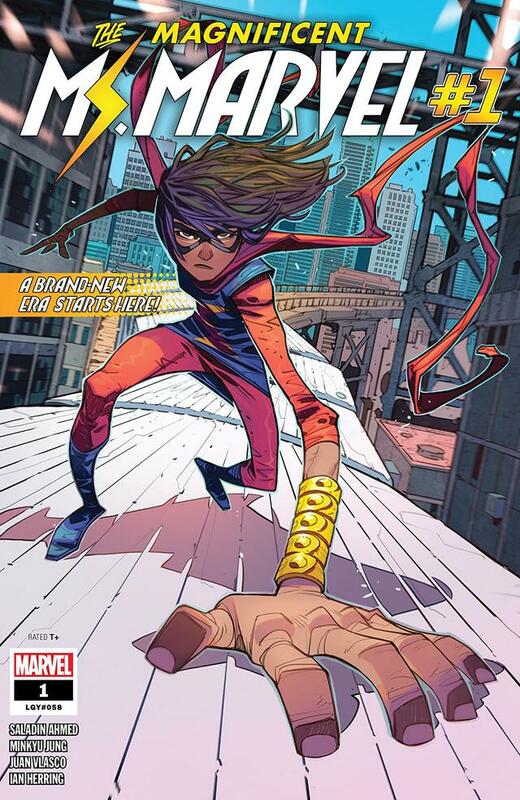 The series writer gives some insight into the brand-new Kamala Khan tale! Today, Kamala Khan, A.K.A. Ms. Marvel, is back once again to fight evil and protect Jersey City in MAGNIFICENT MS. MARVEL #1! Aliens are wreaking havoc in Kamala's corner of the world, and they seem weirdly interested in Ms. Marvel...and her family. And bringing this gripping and delightful tale to life is writer Saladin Ahmed, artist Minkyu Jung, and veteran colorist Ian Herring. We spoke with the new writer, Eisner Award-winner Ahmed, about what it’s like taking on the polymorph hero after G. Willow Wilson’s legendary run and what he hopes readers will take away from Ms. Marvel’s journey ahead. Marvel.com: Tell us a little bit about Ms. Marvel’s upcoming journey as protector of Jersey City in MAGNIFICENT MS. MARVEL #1... Who, or what, will she face? Where is she in life? Saladin Ahmed: Well as we join Kamala she's put in some time as Jersey City's resident Super Hero. She's sort of proven herself, overcome some pretty big challenges, and managed to keep all of her responsibilities precariously balanced. When we join her all of that begins to unravel in pretty dramatic fashion. Aliens attack Jersey City and there's turmoil at home—and Ms. Marvel has to make some pretty hard decisions about who she's going to become to deal with it all. Marvel.com: MAGNIFICENT MS. MARVEL #1 is the first time you’ve written the titular character as the main series writer. What has it been like inheriting responsibility for the character from Ms. Marvel co-creators, writer G. Willow Wilson and editor Sana Amanat? Did they impart any advice that you can share? Ahmed: I was profoundly honored when Willow and Sana came to me and asked me to take the helm on Kamala. And writing this first arc has been a wonderful journey. Marvel.com: How has your past work on Ms. Marvel informed writing this series? Ahmed: Well, I wrote an alternate version of the character for EXILES, but that old woman was pretty different. And while I've done a guest shot here or there, that's very different than digging into a character for a relaunched ongoing title. So I feel like I'm just beginning to scratch the surface! Marvel.com: How do you go about writing existing characters like Ms. Marvel? What’s your process? Ahmed: Well, it depends on the character. There's a big difference between writing Peter Parker, who has been around for 50+ years, and a character like Kamala who has been around 1/10th that long. Even just in terms of researching the character. But with Kamala in particular I approached this from a pretty personal space. She's the most visible Muslim American Super Hero in comics, and I'm a Muslim American geek who's been reading Super Hero comics for 35 years! Marvel.com: What or who did you most want to explore in this series? Ahmed: Well I don't want to give much away, but I wanted to provide Kamala with some of the sort of epic widescreen Super Hero moments that teenagers who look like her rarely get. At the same time I wanted to ask somewhat intense questions about family and sacrifice and growing up that I think Kamala is ready for. Marvel.com: Will we see any old favorites in this first issue? Ahmed: Yes! Kamala's friends and family are a huge part of her world! We will check in with both Bruno and Nakia and Kamala's parents. Marvel.com: On this book, you’re working with Minkyu Jung, who is penciling the series, Juan Vlasco is on inks, colors are by Ian Herring, and VC’s Joe Caramagna is tackling letters. What are your strength as a team in telling Ms. Marvel’s new journey? Ahmed: The art team that we've assembled for this book, led by Minkyu Jung on pencils, is phenomenal! They've really sort of turned it up to 11 in terms of bringing an intensely Super Hero/sci-fi energy. I really think folks are going to be blown away by some of these splash pages! Marvel.com: What do you hope readers take away from this first issue? Ahmed: I think that new readers will get an exciting introduction to Kamala and her world, and Ms. Marvel fans will have a blast seeing the protector of Jersey City level up into her next set of adventures! THE MAGNIFICENT MS. MARVEL #1 is out today! Pick up your copy at your local comic shop now! See artist Minkyu Jung's design process for the suit coming in 'Magnificent Ms. Marvel' #5!